I have arthritis in my back which makes carrying a purse extremely uncomfortable. bank cards, pictures and even folded money. We can slide it into front or back pockets with ease. These are really good quality and last a long time. Thank you for providing them. 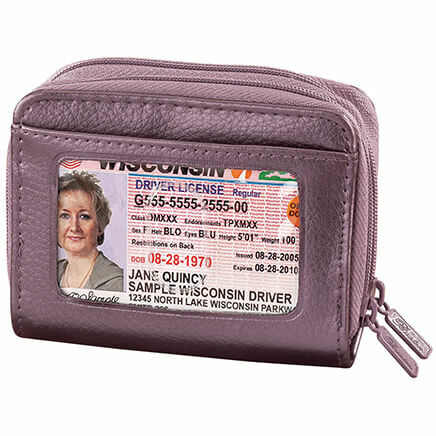 Holds all credit cards for easy assess and also other forms of pertinent information such as insurance cards, etc. in one holder. It is attractive and does not take a lot of room. I would buy this credit card holder again. I have entirely too many credit cards, so this is so helpful to keep the ones I don't use that often in one place at home. When I know I am going to need one, I just take it out and put it back later. My husband has been looking for a way to carry his cards and Grandbabies photo's in one place, this fits his needs. You can't buy wallets anymore that have plastic sleeves to carry your pictures in. So where do you put your pictures? I wanted this card holder to put my pictures in it. It worked out perfect. It held every picture that I had and now they are in a secure place to protect them. This was great. I had a very hard time finding this wallet. I couldn't find it in Canada. My husband loves it!! Great for credit cards and bank cards. Would buy again, and I will when this one wears out. Excellent product. High quality and very practical with good space for cards and nice quality. The leather is soft and supple with the feel of quality. I filled the slots with doctor and dentist cards and carry it with me in my purse so that those professional office numbers are right at my fingertips should I need to contact them in a hurry. 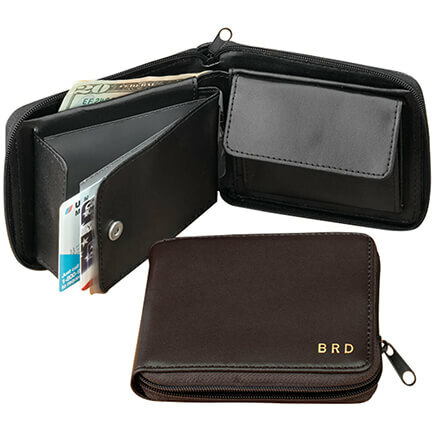 Great for holding credit cards and such to reduce bulk of wallet. I wasn't sure what I was getting for the price - quality surpassed my expectations! I had been looking for something to hold all those reward cards and this works great. I always carry my cards in the holder. I can have each card at my fingertips all the time. 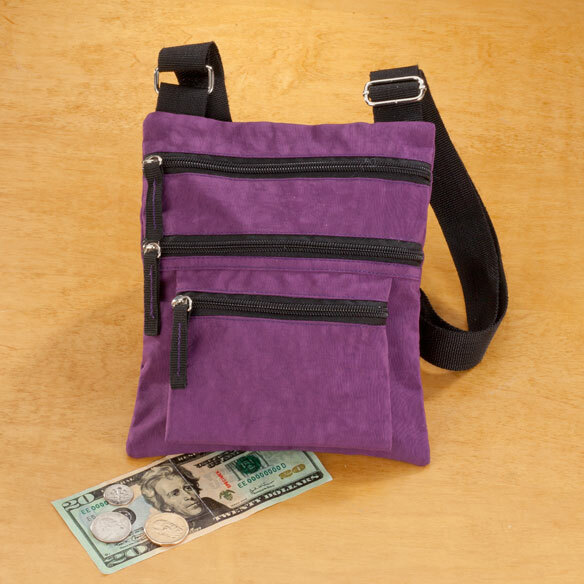 Downsized the type of purse I carried, this is perfect along with a small wallet for cash. to add. When traveling I do not have to take these cards with me as I have the aluminum case for the credit and identity cards. My wallet had been buldging with membership cards and would not fit easily into my hip pocket. That problem is gone thanks to this stylish, easy to use, durable device. While shopping, I always had difficulty finding my credit cards. Actually, I didn't want other shoppers to be aware of which credit cards I was using. Now I organized my cards in alphabetical order. They are so easy to find. 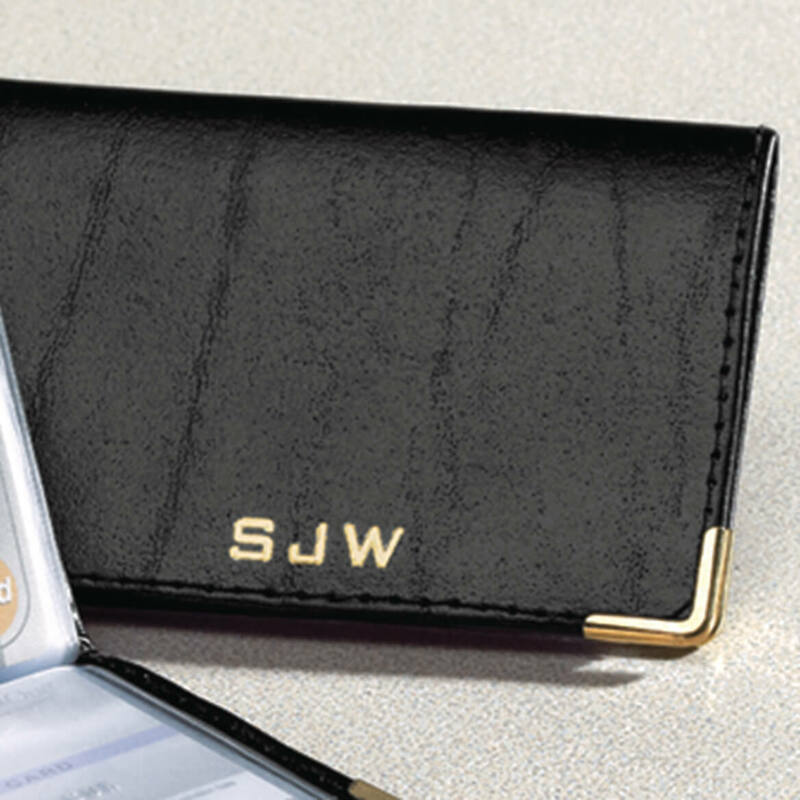 I have been ordering this personalized wallet for many years. If the quality is still the same as the past wallets, then it will last me a very long time. Plenty of card storage and easily slips in my back pocket (I don't carry a purse). The personalization is a nice touch especially if it's a gift. 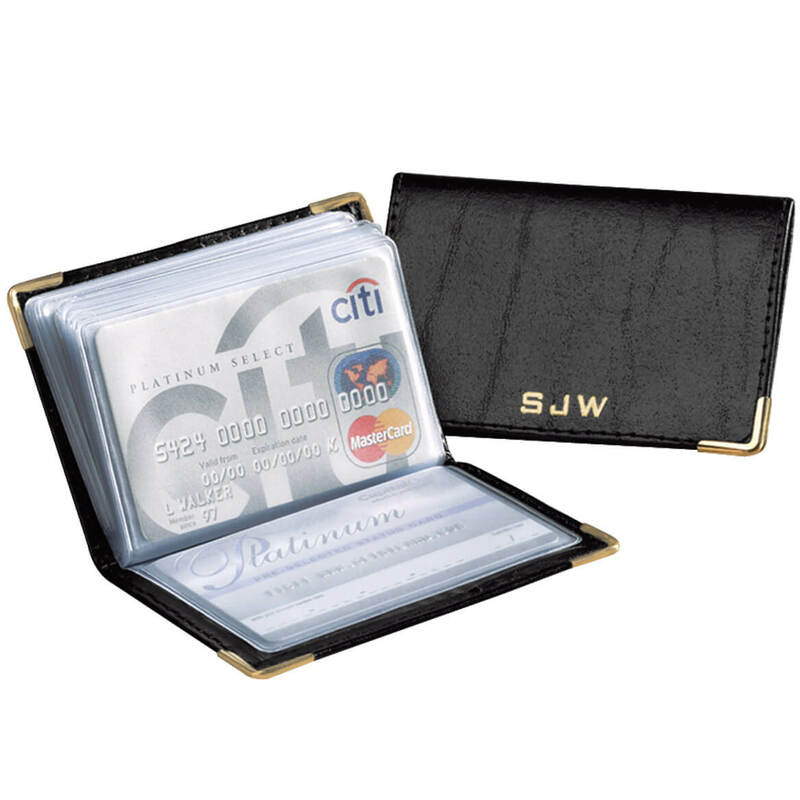 I got this for my boyfriend for Christmas because I noticed he cut his old wallet in half to just use the card holders and so it could easily fit in his pocket, so I wanted to get him something nice, small, stylish, and personal. I wasn't sure what to expect with this wallet since the price was so nice, but it exceeded my expectations. It looks great, fits nicely in his pocket, and he absolutely loves it! I would definitely recommend this wallet! He gets compliments on it all the time! Great for holding lots of cards. My dad was tickled with the photo carrier and his initials in gold against the black leather was a nice feature. Perfect size. Not at all bulky in my purse. My husband has this in his pocket everyday. I bought him one 1 1/2 years ago and it just recently started showing the wear so I bought him another one. It holds all his important things like drivers license, insurance cards, credit cards and pictures of the grandkids. I've been looking for this long time to carry instead of my purse. I don't use the inserts, just needed the two compartments inside the covers. I use one side for my license, registration, AAA card, auto & health insurance cards & put cash in other side. Instead of bringing purse to run errands I just bring this. I actually wear it in my bra or in my jeans pocket. So far it's held up pretty good. Very happy with it. It has organized the clutter in my handbag and I gave my old wallet's clear plastic photo/card holder to my husband to replace the the yellowed, dried out and cracked sleeves in his pseudo antique wallet. He was so happy he didn't even grouse about me buying the new card holder. This product is great to have for my important cards and handy to get to when I need it. Also, my initials look good on the front. Liked so much I bought a second one. Bought a second one to hold cards for elderly parents. This is a great item for me. My daughter loves them also. We have purchased 5 each over the years. I would recommend these wallets to anyone. Like I said before I like items that fit in my pocket but my daughter likes it in her purse and says it is easy to find. They last a long time before needing replacement. I have so many membership cards that I carry with me at all times along with my credit and ATM cards. I did not want to be out and not have my VFW card or one of the others but my wallet was bulging with them all. I had two wallets, this not only holds all of my cards but some pictures as well, fantastic purchase. I love it and it fits in my front pocket no more wallet either. Great product for my husband. Nice initialing job on product. Husband is satisfied that I finally found a useful one. i was on a family trip. i saw my brother and his family that is great. i stayed to long they insisted not so great. I have small pockets so I was looking for a credit card/ID/business card wallet that would fit - this one fits great. It's just a little bigger than the cards. It has plenty of sleeves for cards, and the sleeve insert can be replaced if needed. The personalization is a bonus. I had a credit card wallet similar to this. It was wearing out, so I ordered this to replace it. This one does not hold as many cards. I believe this was advertised as holding 32 cards, but I can only get about 15 in it, if I want it to close. Also, I had to remove two of the sleeves, as they had been cut incorrectly and would not hold my cards. I had a different type also from Miles Kimball that lasted a long time. I think this one is sturdier and will last even longer. Just wanted better packaging for a gift!!! This is a handy product to have. I like this product. It is just what I needed for carrying business cards in my purse. The quality of the leather was not as good as I expected but it is still a good product that I needed. I like the 3 letters personalization also. Overall, a good product to carry even though the leather is not what I was expecting. This item is very nice, useful, and the initials add a lot to it. Purchased this for my husband, and he seems to like it. My photo/credit card value is old and needs to be replaced. Because it has a large amount of slots that I need. My husband loves this item. Fits in his front pocket and very compacted. I chose this item because it was exactly the style that I was looking for. Also, I liked that it could be personalized. Sturdy, easy to find credit cards. Years ago, I bought one from you, and now the envelopes have now split, and everything keeps spilling out. To hold all my important cards, i.e. driver's license, medical cards, etc. My husband loves this card holder. Each one lasts about 2 years so every 2 years I reorder one for him. I've had one before and enjoyed it. But, its seen its better days, so decided to get another. I needed a credit card holder that I could see all my cards well. I've been looking for just a credit card case that wasn't bulky. For my husband, he needed something to put his credit cards in. As a request made by a family member wanting to keep their cards and business cards together. to hold business cards of business associates, doctors, etc. This will hold many cards. Husband always uses a card holder. I liked the idea that it could be personalized. Do the inserts come with it and which way do they open? BEST ANSWER: This is not exactly like the one I bought the one with the zipper all around, and yes the inserts come with it and it opens from the inside (middle seam so cards cannot fall out. what is the difference between plain and personalized leather? Plain leather means no initials or name on the leather card holder. Personalized means you can have your name or initials placed to show it belongs to you. I use it for photos of MY family. That's why I have MY initials on it! How many cards does it holds? BEST ANSWER: Thank you for your question. It holds up to 32 cards or photos. We hope this information will be of help to you. 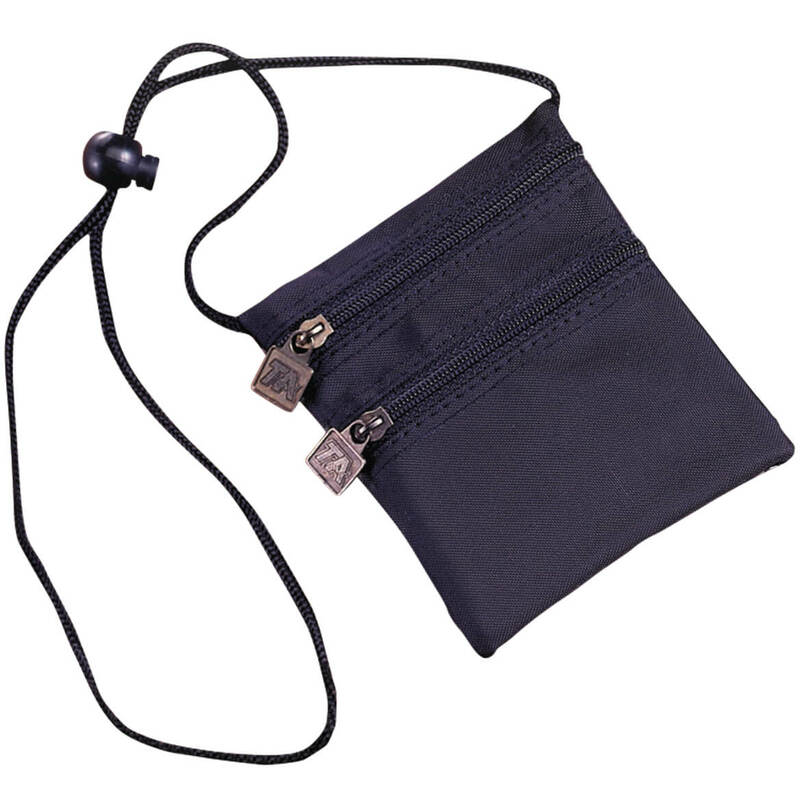 Nylon crossbody bag is perfect for shopping, errands or travel. 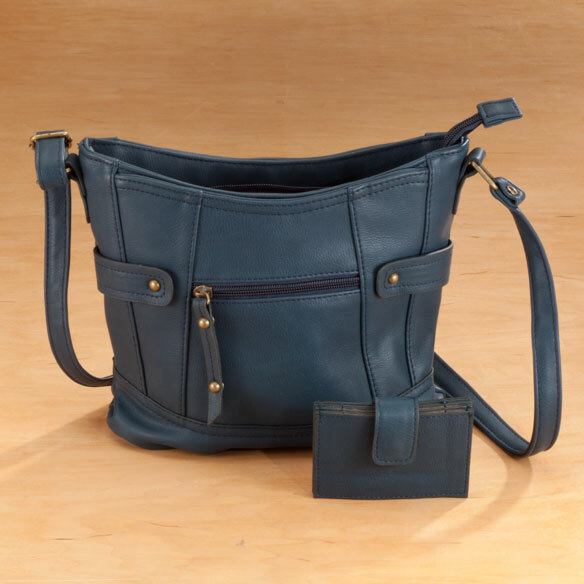 This slender cross body shoulder bag offers 4 zip pockets and hands-free, adjustable crossbody strap (31"-58" long ). Fashionistas will love all 5 colors! 7 1/4Wx8 1/2" high.